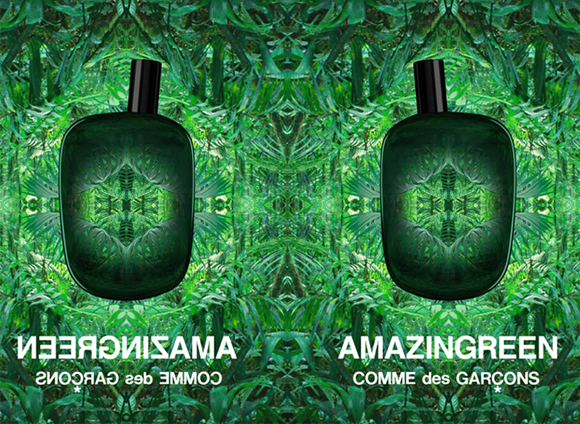 ESCENTUAL.COM SITS DOWN WITH CREATIVE AGENCY CIRCO DE BAKUZA’S PRESIDENT VINCENT DROLET AND ARTISTIC DIRECTOR FRANCIS DESROSIERS TO DISCUSS THEIR VISUAL CAMPAIGN FOR COMME DES GARÇONS’ LATEST FRAGRANCE, AMAZINGREEN. 1) How is designing for fragrance different to other design? FD: The world of fragrance is varied and global and we thus believe that its design must speak to all of our senses. We need to tell a story, create a universe or an iconic object that you will remember just as well as the fragrance itself. 2) Did you enjoy the experience of designing for Comme Des Garcons? FD: It has been like realizing a childhood dream! Every designer wants to work with an inspiring brand like Comme des Garçons and furthermore, collaborating with Puig – such an internationally renowned group, is a real honour. When you take in the fact that you have the opportunity to collaborate creatively with such iconic names, it is nothing short of amazing! 3) What inspiration did you draw from for the branding? VD: The idea behind Circo de Bakuza’s branding was to create a world in evolution. We did not want to generate a static image but rather a visual dialog. We also wanted to have fun and keep an important place for the unexpected. We believe that beauty always emerges through chaos! 4) What feeling are you trying to inspire with the picture? FD: The visuals are an interpretation of the scent. Opening the bottle is akin to entering a lush and exuberant rain forest. A Comme des Garçons fresh and fascinating environment. By using a kaleidoscope effect for the visual, you have the impression of being drawn in by the picture. It’s hypnotic! 5) Are you fragrance fans yourselves? VD: We definitely love working with fragrance; and the idea that fragrance plays with one’s senses is quite stimulating in itself. We believe in creating universes and the olfactive industry offers great opportunities in that regard. It triggers emotions that are strong and visceral, which for us, are the basic elements of creation. The creative process always begins with discerning what you feel and perfume triggers reactions and emotions that leave stronger imprints than what you see or what you hear; so our work with fragrance has to do with finding the right visual tones to complete and complement this spark and transform that into a sensual universe of its own. This entry was posted on Monday, August 6th, 2012 at 2:16 pm and is filed under Fragrance. You can follow any responses to this entry through the RSS 2.0 feed. You can skip to the end and leave a response. Pinging is currently not allowed.